Flared padded arms and a foam filled seat cushion offer ample comfort, allowing you to come home and relax at the end of the day. 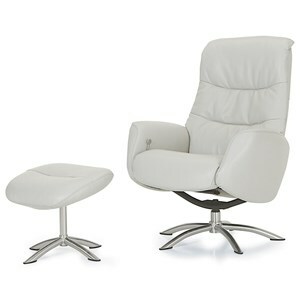 The chrome swivel base gives this piece a touch of modern style. An easy to use recline release on the inner side of the arm will ease you back, making it easy to unwind. 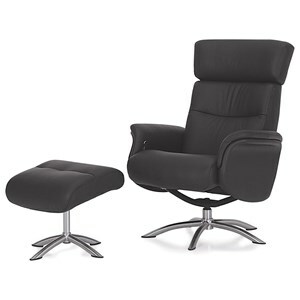 Stretch out and relax at the end of the long day in this reclining chair and ottoman set. Available in a wide variety of leathers by special order. Pricing and availability may vary. 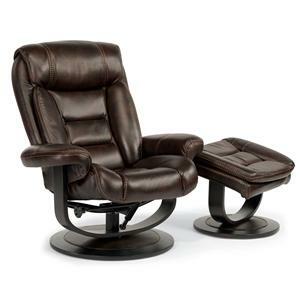 The Quantum Contemporary Reclining Chair with Swivel Base and Ottoman by Palliser at Furniture and ApplianceMart in the Stevens Point, Rhinelander, Wausau, Green Bay, Wisconsin Rapids, Marshfield, East and West Madison, Wisconsin area. Product availability may vary. Contact us for the most current availability on this product. 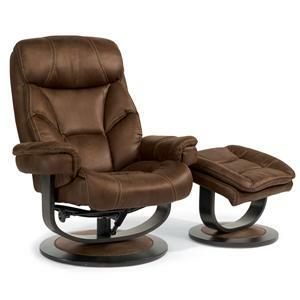 50004-Q04 Reclining Chair 1 30" 34" 41"
Browse other items in the Quantum collection from Furniture and ApplianceMart in the Stevens Point, Rhinelander, Wausau, Green Bay, Wisconsin Rapids, Marshfield, East and West Madison, Wisconsin area.